← Cook, Where’s My Hasenpfeffer? OK, Summertime is officially here so it’s time to grill, right? Maybe you busted out your hibachi for the first time on Memorial Day, but one of the nicest things about living in the south is having month after month of weather warm enough for outdoor cooking. Things definitely pick up a bit once the kids get out of school, though. We do standard grillfare pretty regularly–burgers, steaks, and assorted sausages. As of late, though, kabobs have become our go-to grill choice if we’re doing chicken. For kabobs, I use 3 tsp of cumin and 1 tsp of garlic powder, but I have used this same brine with lots of spice profiles for lots of other dishes. The volume here is enough to completely submerge 3 or 4 chicken breasts.You will want to brine the chicken for at least an hour. Since I skewer up small pieces of chicken, I cut them before I brine them to increase surface area (and hence flavor). The great thing about kabobs is that you can work out multiple permutations of what ends up on everybody’s plate pretty easily. A nice little trick that I picked up from Good Eats: skewer your items separately (red peppers on one stick, onion on another, chicken on a third, etc.) so that you can have more control over doneness of each item. For a side, we always go with bulgur wheat. 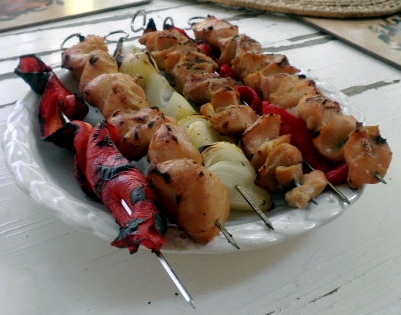 This entry was posted in Uncategorized and tagged chicken, grilling, marinades, summer. Bookmark the permalink.